St. Louis, Missouri — It’s not every day you go out to fish on the waters of the Missouri River and come back swimming in a media frenzy. Of course it could happen if, like Greg Bernal, you manage to topple a Missouri state — and quite probably a world —record. That’s just what did happen to the Florissant angler after he reeled in a 130-pound monster blue catfish (Ictalurus furcatus) in the early morning hours of Tuesday, July 20. Bernal and his fishing companion, Janet Momphard of St. Charles, set out Monday night for a catfishing trip on the Missouri River in St. Louis County near Columbia Bottom Conservation Area. They were in place by around 9:00 p.m. that evening. Bernal was fishing from his boat using rod, reel, and 40-pound test line. Cut silver carp was on the hook for bait. With storms approaching, the two decided to call it quits by 1:00 a.m. Then, at around 12:45 a.m., Bernal‘s line tightened. The fish soon worked its way out and the fight began. It was a difficult struggle. “But I had my footing on him,” said Bernal. After 15 minutes, Bernal managed to pull the fish to the boat. From there it took him and Momphard a half hour to wrestle the behemoth from the water. Momphard knew right away her companion had landed a big one. Tuesday morning the two took their catch to the Missouri Department of Conservation’s Regional Office at the August A. Busch Memorial Conservation Area in St. Charles. There, Fisheries Management Biologist Sarah Peper set out to weigh and measure the fish. The blue cat was taken to the Straatmann Feed Store in nearby New Melle, the nearest state-certified weighing scale. * Fisheries biologists estimate its age at 20-30 years. The monster cat easily displaced the previous Missouri state record — a 103-pounder landed in 1991 — allowing Peper to officially certify Bernal’s catch as the new Missouri state record blue catfish caught on pole and line. 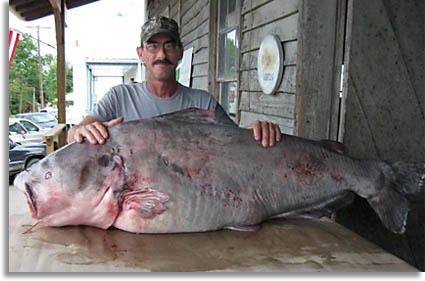 The lunker also bested the 124-pound standing world record blue cat — caught in May 2005 from the Mississippi River near Alton — by 6 pounds, making Bernal’s fish the new world record, pending official confirmation. Peper completed the world-record application for Bernal to have notarized and submit to the International Game Fish Association, the organization responsible for declaring the fish’s official status. Bernal and Momphard returned to the Conservation Department office where they were greeted by a flurry of news media. As a Fisheries Biologist, Peper sees Bernal’s prize as good news for all Show-Me State anglers. “The fact that this fish, and the standing world record blue catfish, were both caught near the same area goes to show the kind of world-class fishing we have in Missouri,” she noted. But to Bernal, it comes down to something more visceral.